The ultimate controller of the entire universe(s), as well as the eternally worshipable forms for all Gods & Goddesses (Devas&Devis) and the ultimate Guru (Spiritual Master) of our lineage (Parampara) is the Supreme Personality of Godhead, Sri Krishna. 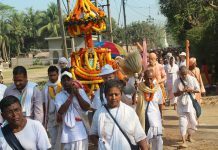 In order to deliver people from the influence of this age of quarrel and hypocrisy, known as Kali-Yuga, Lord Sri Krishna appeared in the form of Sri Krishna Chaitanya Mahaprabhu with his intimate associates and abode here in this material world in order to spread the glories of Hare Krishna Mahamantra to every town and village. The Hare Krishna Mahamantra is the one and only mantra which exists here in this world, which can transport all living entities from the material world to the eternally blissful spiritual abode, GolakaVrindavan. Each of us are actively engaging every step of our lives in order to get the taste of eternal bliss. However, due to the influence of illusion (maya) we are attacked in every conceivable way and consequently we are giving way to laziness and intentionally convincing ourselves with so many excuses to avoid chanting Hare Krishna Mahamantra. 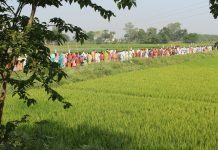 Instead of focusing on chanting throughout our daily schedule we are all dedicating ourselves to running after material name,fame and distinction. The influence of illusion(maya) is telling us again and again that the material name, fame and distinction are the pathway to reach eternal bliss. 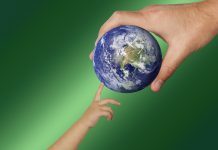 As a result of this influence, we are wholeheartedly engaging all of our endeavors to satisfy these materialistic ambitions. A desert traveler becomes extremely thirsty and finds himself running towards a distant mirage in pursuit of drinking water only to later discover that in fact there is no water and that he is running towards an illusion. In this way, eventually due to lack of water he is at risk of suffering the loss of this invaluable life, which is a rare and precious opportunity for each and every one of us. Similarly almost all of us are in this desert of illusion(maya) and we are all chasing the fleeting mirage of name, fame and distinction. The Hare Krishna Mahamantra preaching movement of Lord Sri Krishna Chaitanya Mahaprabhu is intended to inundate our dry deserted heart with a flood of transcendental nectar. The mellow of this nectar is only available to a person who has the tendency of Chaatak bird (Pied Crested cuckoo bird). The Chaatak is a peculiar Indian bird whose distinction is that it will only drink rainwater which decends from the heaven. This is analogous to one who is connected with the Gaudiya lineage and is dedicated exclusively, without any hidden agenda for material gain (name & fame and distinction), to continuing to chant Hare Krishna Mahamantra by which he can reach the spiritual world. Such a devout soul who is optimistic to return to the spiritual abode, Sri Goloka-Vrindavan by maintaining extreme tolerance with respect to the variety of different material obstacles is much like the Chaatak-bird who is always waiting for rainwater as its only source of water despite being surrounded by so many terrestrial sources of water such as a river, lake or pond. The founder of the entire Gaudiya Math and all of its branches, my Grand Spiritual Master, His Divine Grace Srila Bhakti Siddhanta Saraswati Goswami Thakur Prabhupada’s and one of his dearest and most affectionate disciples, His Divine Grace Srila Bhakti PramodePuriGoswami Thakur established Sri Gopinath Gaudiya Math in 1989 at Mayapur. As soon as we are able to serve all the members of our lineage with full of enthusiasm we can get the mellow of Harinam-Nectar. In this way we should pray to our Gurudeva and by extension Lord Sri Krishna from the bottom of our heart then soon Lord Sri Krishna will appear to us in the form of ‘Guru’ and scriptures (Shastra)and inform us as to how to get the mellow of Harinam-Nectar into our hearts. The literal meaning of the above sloka/verse: As per scriptures, Krishna will appear to us in the form of ‘Guru’ and that form of Krishna bestows His mercy onto all of us. According to the above instruction from Sri Chaitanya Charitamrita we will come to know that we should keep a clear understanding that ‘Guru’ is non-different from Krishna and is in fact, a direct manifestation of Krishna. The importance of ‘Guru’ as described in the above verse is that he is showing us by example that he is the servant of the servant of our lineage. Otherwise, Srila Bhakti Siddhanta Saraswati Goswami Thakur Prabhupada said that the Guru’s 2nd syllable ‘ ‘u’ should be deleted and instead of ‘u’ we should use ‘a’ i.e ‘Garu’; in Bengali language ‘Garu’ means a cow. This is indicating the inferior quality of consciousness. Today is the fourteeth waxing moon cycle day (Gour-Chaturdasi day). Whoever assembles for offering due respect towards me and is praying for my spiritual well being and observing my birth day ceremony, I am humbly requesting to all of them that please keep your schedule to worship the entire members of the Guadiya lineage, which is called ‘Vyasa-Puja’. Also, on my behalf please pray to all members of lineage that they allow me to be a real servant of my ‘Guru’ i.e servant of Srila Bhakti Pramode Puri Goswami Thakur as well as the entire parampara. The Founder of Sri GopinathGaudiya Math, my spiritual Master has an exemplary quality – ‘humility’, the ornament of all Vaisnava qualities. Nowadays the entire Gaudiya world is showing deep respect for my spiritual master as an embodiment of the third sloka of Sikshastakam, which is composed by Sri Krishna Chaitanya Mahaprabhu. The Present Acharya of Sri Chaitanya Gaudiya Math, His Divine Grace Srila Bhakti BallabhaTirtha Goswami Maharaj and as well as all other Vaisnava-Acharyas agree that the rare and bright Vaisnava quality of my spiritual master is the above opinion about his deep sense of humility. Ttranslation : One should chant the holy name of the Lord in a humble state of mind, thinking oneself lower than the straw in the street; one should be more tolerant than a tree, devoid of all sense of false prestige and should be ready to offer all respect to others. In such a state of mind one can chant the holy name of the Lord constantly. The essence of the four Vaisnava-qualities: humility, tolerance, respect all- (even persons not deserving any quality to get respect from others) and blissfully chanting Hare Krishna Mahamantra constantly. 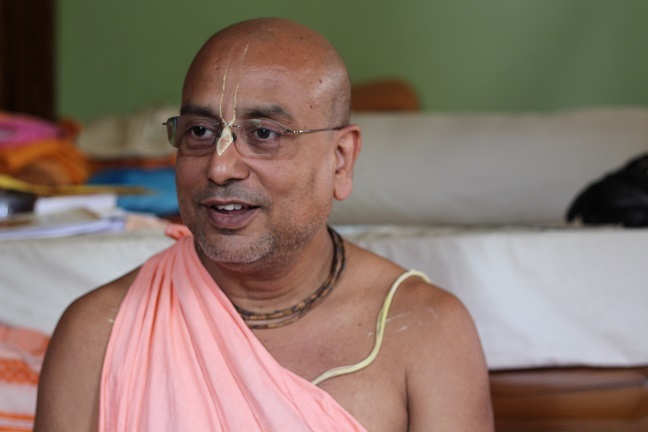 Whoever is representing that they are followers of Sri Gopinath Gaudiya Math, should observe the above four Vaisnava qualities in every aspect of their life, which was taught and shown to us by my spiritual master in his life. As soon as we are able to establish these principles in our lives only at that time can we be qualified as the real followers or servants of Srila Gurudeva, His Divine Grace Srila Bhakti Pramode Puri Goswami Thakur. Due to the influence of the present age, Kali-Yuga, we are all more or less unable to maintain the principles which our Srila Gurudeva showed us by his example. We know from the instruction of Srila Bhakti Siddhanta Saraswati Goswami Thakur Prabhupada that as much as we distance ourselves from the lotus feet of Srila Gurudeva, the same level of material attraction will disturb us. Today, my humble prayer is to all of you to keep your main goal for observing the ceremony to satisfy Sri Sri Radha Krishna only and make me happy. Please excuse me, if you see any mistakes in my above writing and bless me to carry the loving Mission of Sri Krishna Chaitanya Mahaprabhu with purity for rest of my life. Yours in the service of Sri Guru & Sri Gauranga. Please accept my humble obeisances and All Glories to Sri Sri Guru and Gauranga. I met you briefly at one of your programs when you were living at Mahadevan Prabhu’s house in Singapore (Yishun) and left abruptly for work since it was getting too late. This was about 6 months ago. I would like to see Maharaj again if you come by to Singapore. I am in touch with Mohanlal Prabhu (diciple of Srila Narayana Maharaj) and he keeps me informed of your schedule. You were schedule to stop by in Singapore for a day or so two weeks ago but I think you went straight to Australia or something. I was eager to meet you but Mohanlal Prabhu told me that you did not stop over at Singapore. My email address is yanasagaran@hotmail.com and my phone number is +65 90504185. I am really looking forward to have your association soon.